Don't leave for your trip to the Wizarding World of Harry Potter without these tips. Going to Universal Studios’ Wizarding World of Harry Potter was a big deal for our family of six. Not only because all of us—adults and kids spanning the age of one through 12—have long been fans of the books and movies, but because the cost of flights, lodging, and tickets were a significant investment. A one-day general admissions ticket to Universal Studios Hollywood starts at $105 ($179 for a Universal Express pass), while a one-day/two-park ticket to Universal Studios Florida (Diagon Alley) and Universal’s Islands of Adventure (Hogsmeade) starts at $160. Near closing time on our recent trip, as we raced to one last ride for the older kids, our younger ones passed out in the double stroller, I wish I’d known I could have unwinded with a Hog’s Tea, the (unadvertised) strongest drink you can order at Hog’s Head in Hogsmeade. In fact, now that I’ve returned from vacation, I’ve discovered a few other Harry Potter World secrets I wish I’d known before boarding my flight. Here are eight hacks you don’t want to miss. 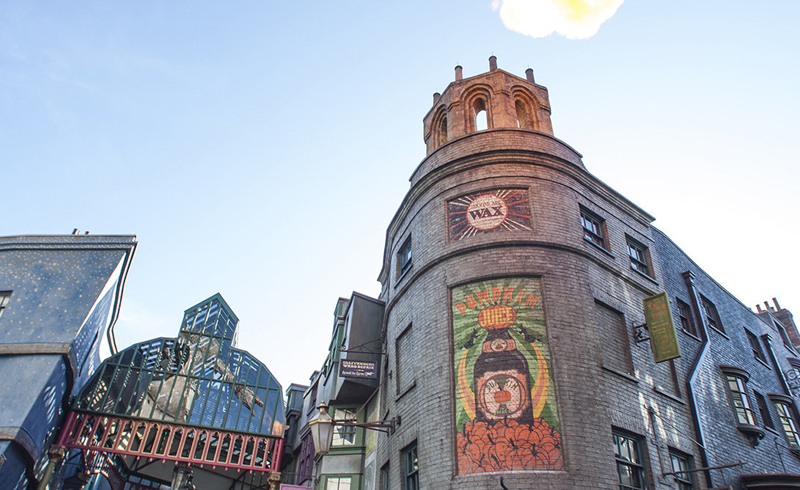 While there are 16 spells mapped out in Diagon Alley and 9 spells mapped in Hogsmeade in Orlando and Hollywood, the rumor is true that there are hidden spells. At Diagon Alley’s Scribbulus Writing Implements, go to the window on the right. Point your wand at the Marauder’s Map and draw a triangle. 14 different things can appear on the map. At Slug and Jigger’s Apothecary, point your wand at the dragon poop and draw a clockwise circle with a line down the middle. The poop moves and also releases a smell. Just to the left of this spell, point at the flower and draw an “h.” The flower will bloom and retreat. If you place your map under the black light in Diagon Alley’s Knockturn Alley, the shapes of spells will appear. Hint: Look for 4 red dots, those are the camera sensors. Move only your wrist not your whole arm to stay within the camera’s field. At Diagon Alley’s the Hopping Pot and Hogsmeade’s Hog’s Head Pub, you can order a secret drink called the Deathly Hallows (Strongbow Cider, layered on top of a dark heavy stout called Wizard’s Brew and a lager called Dragon Scale). Be prepared that the bartenders can’t acknowledge that name and you certainly won’t find it advertised. Also at Hog’s Head Pub, order the Hog’s Tea and Pear Dazzle (vodka and pear cider). 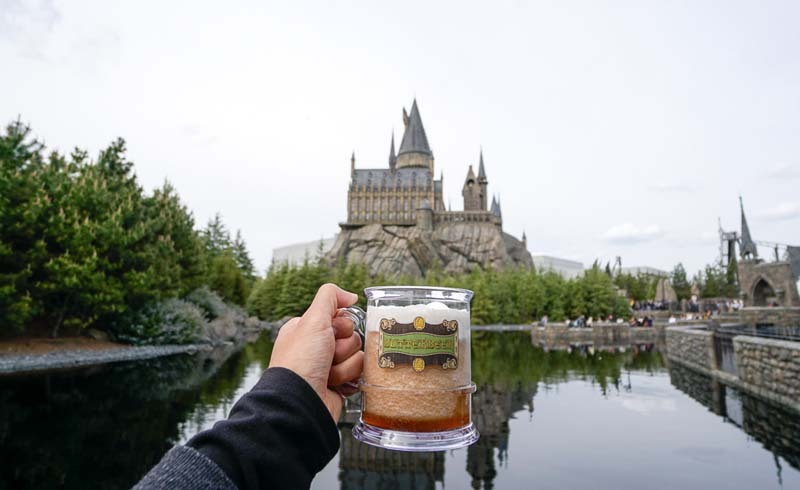 Hint: You can get your drink in a to-go cup and ride the Hogwarts Express. There are 46 character wands and 13 Ollivander wands (Ash, Alder, Birch, Elder, Hawthorn, Holly, Hazel, Oak, Reed, Rowan, Ivy, Vine, Willow) available for purchase. J.K. Rowling, by pure coincidence, chose Holly for Harry Potter because of to its evil repelling properties before knowing that it corresponds to his birthday in the Celtic calendar. Thereafter, she chose Hermoine and Ron’s wands according to this calendar. If you buy a wand at Universal Studios Hollywood, it will also work at Universal Studios Orlando, too. The Diagon Alley map will not be included in your wand box but you can obtain one at any of the Diagon Alley merchandising locations or call guest services to have it mailed. The fluffy pink Pygmy puff first appeared in Harry Potter and the Half-Blood Prince. If you’re planning to buy one (how could you not when they’re so adorable), make sure you ask for a naming ceremony. At Zonko’s Joke Shop and at Weasleys’ Wizard Wheezes, the wizards and witches will perform a ceremony for your new pet and remind you that it likes to eat spiders, ear wax, and boogers. In Orlando, listen closely to the Vanishing Cabinet inside Borgin and Burkes for a bird chirping. There’s also a boggart trapped inside a trunk. And when you’re heading to the Hogmeade train platform, look for the horseless carriage. You won’t be able to see the thestrals but you can hear them. In both parks, make sure you also ask the wizards and witches whether they’ve seen Voldemart, where Platform 9 ¾ is located, and what their house’s secret handshake is. Their reactions will make your whole Harry Potter World experience that much more real. Banter with the goblin behind the counter at the Gringott’s Money Exchange in Orlando before trading in your U.S. dollars (in denominations of $10 and $20) for Gringott® bank notes, which can be used in Diagon Alley and Hogsmead shops and restaurants. Make sure to look around the goblin’s desk, too. The gold coins are from the films. Want to make your friends and family really jealous of your visit to Hogwarts? Purchase a postcard (or bring your own stationary) to mail at The Owl Post. All letters and postcards that get sent out are stamped with a Hogsmeade postmark. And if you want to hear a Howler, there’s one here. Don’t worry the owl poop on the ground that you might’ve stepped on. It’s fake. The Harry Potter and the Forbidden Journey Ride at Universal Studios Hollywood is enhanced by 4K-HD so that the dragon, snitch, and dementors appear super close to your face and the forest and Chamber of Secrets is expanded, making it the most immersive version of this ride on the planet. When you get to the top of Hogwarts castle in Hollywood, turn around and notice how the mountains are framed so that you feel like you’re actually at Hogwarts.